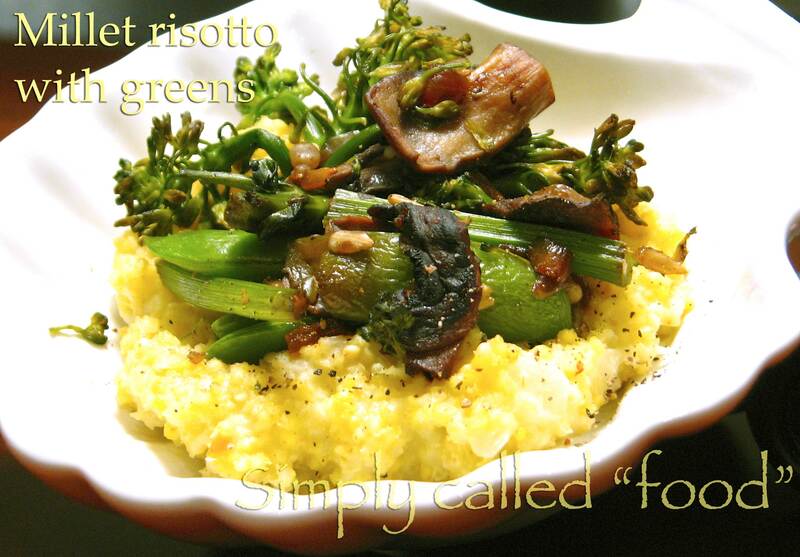 Millet “Risotto” with greens | Simply called "Food"
Usually millet has a dryer texture like couscous. Cooked this way, it becomes creamier and interesting. I got the idea from the book “Supergrains: Cook your way to great health” an made a few modifications. It is an alternative to rice and quinoa and it’s gluten free. You can also cook it like rice in a 2 part of water for one part of millet for about 20 minutes, sometimes you may need to add a bit of water. But the result won’t be the same. Stir the millet and the balance of the onion, so all the grains are coved with oil. Add 1/2 cup of vegetable broth until it’s all absorbed then continue to add 1/2 cup at the time until you put it all. Add the cheese and stir for 2-3 minutes until it’s creamy. You may need to add a bit more water. In the meantime, thinly slice the mushrooms. In a pan over medium heat, put the oil and add the mushrooms, add salt & pepper. Don’t stir them right away, let the turn brown. If you play with them too much, they will release more water and start to boil. Finely chop the onion. Add 1/2 of it in your pan and let cook for 5 minutes. Add the baby broccoli and the snow peas and cover for 10 minutes. Serve your vegetables on top of your millet. Very tasty! Tags: Food, Fruit and Vegetable, Gluten free, Grains, Millet, Recipe, Seeds, Vegetarian. Bookmark the permalink. Thanks for the link! Your recipe looks good too!